June 23, 2016 – IK Multimedia is pleased to announce that iKlip® A/V, the first broadcast mount for professional audio and video recording with smartphones is now shipping. 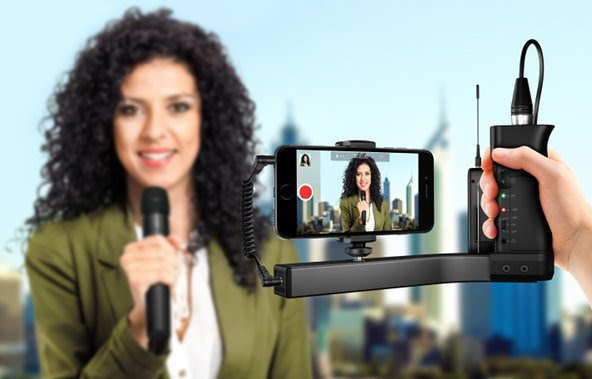 iKlip A/Vnow gives broadcasters, videographers and digital storytellers the ability to capture and monitor professional-quality audio for their videos on the go using its integrated high-quality XLR mic preamp with phantom power and built-in wireless receiver support. It also helps deliver a steady picture thanks to its secure smartphone holder and ergonomic handgrip. iKlip A/V gives everyone the power to use their smartphone or compact video camera as a full-featured broadcasting solution with professional quality audio. Until now, getting pro quality audio while shooting video on a smartphone had been a challenge. Developed in Italy with input from professional field reporters and broadcasters as a cost effective – and more readily available – alternative for field reporting, iKlip A/V is designed to help videographers capture professional quality audio for their mobile video productions. iKlip A/V is also perfect for mobile reporting through online media outlets or social channels like Facebook, Periscope or Snapchat, or smartphone filmmaking for YouTube, Vimeo or Instagram. It features an integrated microphone preamp with gain control that lets users record with high-quality external microphones thanks to its XLR input. iKlip A/V also delivers 48V phantom power for high-end condenser mics using two AA batteries and features a built-in support bracket that can hold most popular wireless microphone receivers. 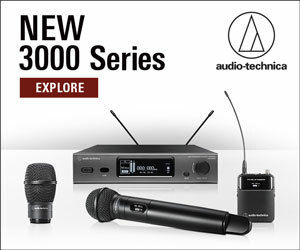 Its input gain control, headphone monitoring output and 1/8″ TRRS audio output ensure a great signal no matter what microphone or device is used providing streamlined recording experience. iKlip A/V features a large ergonomic handheld grip and an expandable smartphone holding bracket that shares the same technology as IK’s iKlip Xpand Mini and the iKlip Grip for ultra-steady shooting. It can securely hold any iPhone, iPod touch or Android device with a screen size from 3.5″ to 6″. iKlip A/V can also be attached to a monopod or tripod thanks to the standard female threads on the underside. Its smartphone holder bracket can be detached and replaced with a compact video camera thanks to its standard camera mount. No matter how it’s used, iKlip A/V delivers an effortlessly stable picture quality. iKlip A/V works with any smartphone or camera that accepts a 1/8″ (3.5mm) TRRS (CTIA/AHJ wiring standard) audio input. With an optional iLine Camera Adapter cable, iKlip A/V can be used with any camera that has an auxiliary microphone TRS input, meaning that it can deliver great broadcast-quality results with any compatible device that can either fit on its grip or fit on iKlip A/V’s standard camera mount. iKlip A/V is available now from photo/video, music and electronics retailers worldwide, and from the IK online store, for only $/€179.99 (excluding taxes).